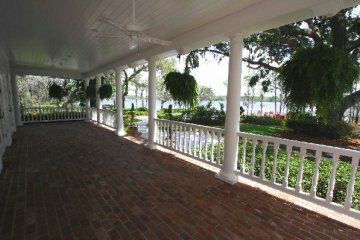 We are pleased to present another beautiful lakefront estate in Windermere – “Peacock Knoll” – on approximately 2 acres nestled on the pristine shores of Lake Butler – a part of the famed Butler Chain of Lakes. 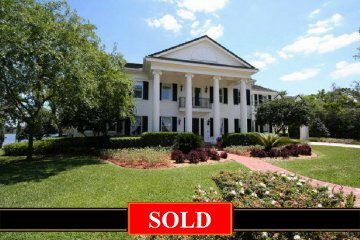 The residence is fashioned to instill the spirit of the “olde South”, and was custom built in 1996 by the current owner with today’s conveniences and is very well maintained. This grand estate is approached from an impressive circular drive and is proudly positioned on a gentle knoll where beautiful wild Peacocks occasionally stroll across the grounds. 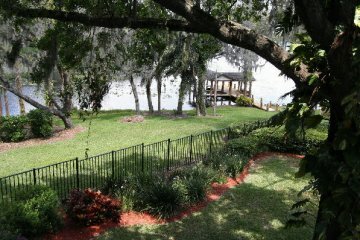 Beautiful terraced, English flower gardens in the rear gently step down from the veranda to a large Boat House and a lakefront heated Pool and Spa, framed by a generous landscaped terrace accented by colorful Florida plantings - the perfect setting for large family or business gatherings! Large hanging ferns on wide verandas and balconies, which embrace the home, gently dance in the lakefront breezes that flow off the lake and through many French doors into a spacious living area. There is so much to do – right on your own estate – fishing, boating, water skiing and swimming all year long in the lakefront , heated pool – or just relax after a long day in the heated spa. 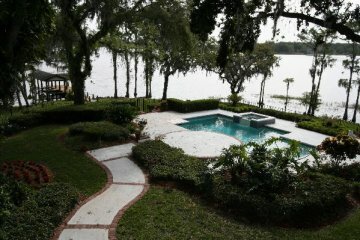 Imagine hopping in your boat, conveniently docked at your back door, and cruising on the famed Butler Chain of Lakes. For those who are less active – just sit back and relax in one of those big rockers on the veranda and enjoy the view and the breezes – and maybe a mint julep! 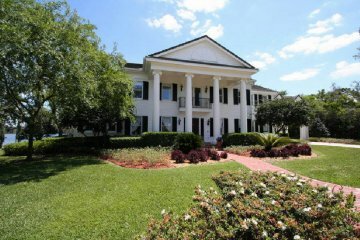 The interior is a charming replica of a spacious plantation home one would find in the olde South - yet 8,051 Sq. Ft. (heated & cooled) with all the amenities you would ever want. Upon entering you are greeted by an impressive staircase with open balcony. 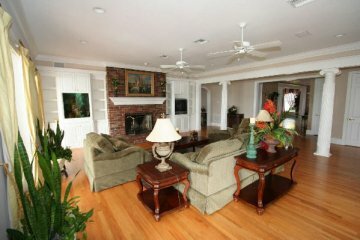 Formal rooms are located to the left and right of the 29’ foyer. 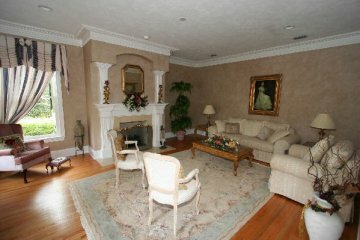 Ceilings are high and beautifully detailed with exquisite moldings throughout. 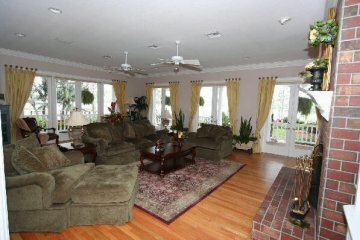 The walls of the 26’ Family Room are lined with French doors opening to lakefront wrap-around verandas. 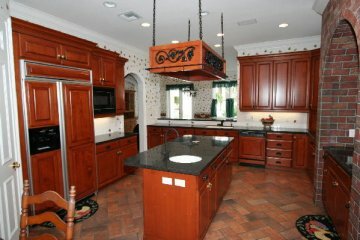 The kitchen boasts a serving/snack bar which separates the 16’ wide breakfast area from the cooking area where gleaming black granite tops an abundance of solid Cherry wood cabinets For convenience there is a message center and walk-in pantry. A rear hallway with half-bath leads to the back staircase which ascends to the secondary bedrooms and media room. The 28’ Master Suite boasts a fireplace and many French doors opening to the balcony with exquisite views of the lake and beautiful sunsets. Coffee is only a step away in the adjoining Breakfast Bar. A 25’ marble-floored Master Bath includes two wardrobe rooms, twin vanity area, whirlpool tub and 8’ enclosed stall shower. 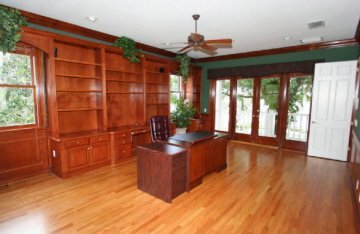 A handsome 23’ Study/Home Office, with paneled walls, is designed for efficiency with a custom computer center – even a private lakefront balcony. A large Media/Game room will delight the young ones. For long-staying visitors or staff there is a large guest apartment with a private entry. All this and only 15 minutes to Disney and all attractions! 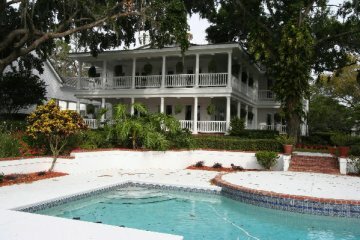 The setting is so beautiful-you won’t want to leave home! $4,100,000.